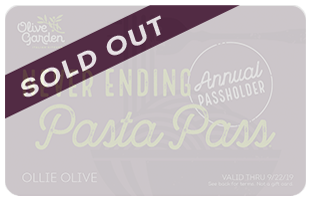 Chrissi and I may have secured Olive Garden Pasta Passes for the second year in a row. Well, last year she got one, and it was for eight weeks. This time, we’ve both got one coming. And they’re good for a WHOLE YEAR! WE ARE GOING TO DIE OF AMERICAN ITALIAN COMFORT FOOD THIS YEAR. Stay tuned, I will have to document the suddenly-incredible year to come. *Note: Olive Garden and Darden do not support/condone/sponsor or otherwise approve of my message or goals.